Whether you're now an umbraphile - someone who chases eclipses - or looking to see your first one, you're in luck! Another total solar eclipse is just around the corner, in less than a year, but you'll have to travel to South America. For the next eclipse in the Lower 48, mark your calendar for April 8, 2024. Solar eclipses aren't terribly unusual: The Moon intersects the Sun's light once every 18 months on average. But for any singular place on the planet, to fall into the Moon's full shadow occurs only once every 375 years. Earth's surface is 75 percent water - and many areas on land are remote or inaccessible. Thus, while solar eclipses aren't rare per se, the opportunity to see a total eclipse certainly is. La Serena - a Chilean city just 300 miles (483 kilometres) north of the capital of Santiago - lays directly in the path of totality. By then, totality will only persist 2 minutes 35 seconds. The best shot at clearing will be on the eastern slopes of the Andes, where sinking air - subsidence - may locally evaporate pesky clouds. Now if you're not looking to spend a small fortune or fly halfway across the world next year, you'll get your chance too - you just have to be a little more patient. This eclipse will be even more spectacular than last year's. Because of this, it will block the Sun longer - creating a longer eclipse. It also means the umbra will be 110 miles wide vs. 70 miles wide last year. Likewise, if you live on Liberty Road in Aubrey, Texas, you'll miss out. But walk to your neighbors on Bailey Lane, and you'll be in luck. 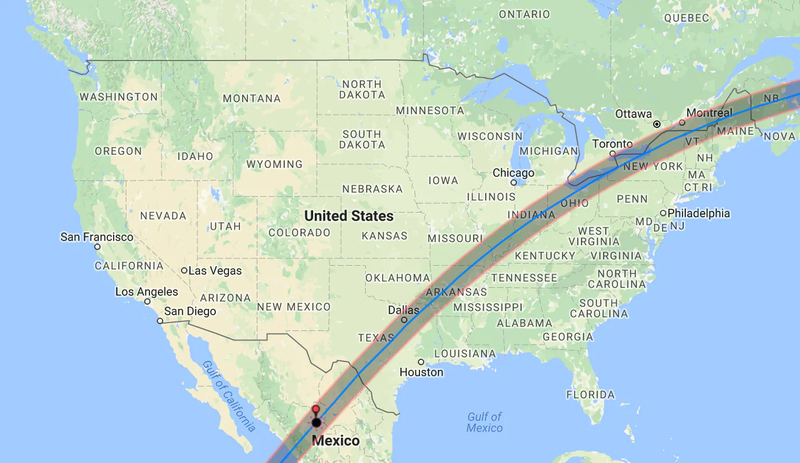 That's how local the path of totality is, and why it's so important to be within it. And if you're at the Walmart off 410 in San Antonio, make sure to shop smart - the produce section is in totality, but the tire department isn't. It truly will be "out of this world" - hence why it's been my plan for many years to be married there on that day during totality. No stealing my idea!